G. H. Hovagimyan is an experimental cross media, new media and performance artist who lives and works in New York City. Hovagimyan has been working in a variety of forms since the 70s. An internet and new media pioneer, his works range from hypertext pieces to digital performance art, interactive installations and HD video. His works have been exhibited at MoMA, Mass MoCA, The Whitney Museum, The New Museum, The Walker Art Center, Jeu De Paume, MAC Marseille, MAC Lyon, Pompidou Center, Lincoln Center, ICA The Clocktower, The Kitchen, The Alternative Museum, Eyebeam Art & Technology, List Visual Arts Center, La Gaite Du Lyrique, Stuttgart Kunstverein, Steim Institute, the Moscow Center for Contemporary Art, Postmasters Gallery, Pace Digital Gallery. Hovagimyan's work often provides a somewhat humorous, yet seriously rebellious and innovative approach to social media, its constructs, and the division between the physical and digital self. The use of technology as the primary medium for his work questions all of these elements simultaneously. Viewers sometimes use their physical bodies to change the virtual. For example, in works such as Post Browser (see below) they use their own interactions to recreate the websites of a famous art institution. These works examine new ways of interpreting websites, interactive technology, and our ideas about how all of these cultural aspects affect our lives on a daily basis. He has collaborated with English/French sound artist Peter Sinclair on a number of works and was an active member of the artist's group Colab. From 1973 to 1986 he was involved in the SoHo and Lower East Side underground art scene. His first solo exhibition, a rigorously conceptual art show at 112 Workshop in 1973, was titled Control Designators. "...Hovagimyan made use of three types of designators to direct the viewers experience of the space at 112: 100 number codes indicating the surface topologies of the space, three visual sighting devices functioning like a gun-sight to locate 100 points in the space, and 100 language signs giving directions for the ways to think about the space and move around within the space. The system was based on Jean Piaget's theory of child development as opposed to adult intellectual development. Thus, the basic matrix of the artist's code was related to the progression from undifferentiated surface topology through geometric triangulation to the linear sense of language experienced in reading." He has worked with artist Gordon Matta-Clark on several projects, namely: Days' End, Conical Intersect, Walking Man's Arch, and Underground Explorations. In 1974 during the video-performance series at 112 Greene Street, he performed opposite Spaulding Gray in Richard Serra's video A Prisoner's Dilemma. Much of Hovagimyan's early work was ephemeral in nature. It involved performance art, written and language works, and temporary installations in galleries. A word piece, Tactics for Survival in the New Culture, was exhibited in "The Manifesto Show" (1979) organized by the artist collective Colab. This particular piece was to become the basis for one of his first online hypertext works in 1993. He showed in several group exhibitions organized by Jean Dupuy, a French Fluxus artist living in New York at 405 E. 13th Street. In 1980 Hovagimyan did a series of punk performance pieces for Artist's Space series called Open Mic. One piece, Rich Sucker Rap was recorded by Davidson Gigliotti for a video tape called Chant a Capella which Electronic Arts Intermix carries in its catalog. He also performed in several No Wave Cinema films among them, The Offenders (1980) by Scott B and Beth B and The Deadly Art of Survival by Charles Ahearn. "Tactics for Surviving in the New Culture", original 1974, hypertext web version, 1995. http://www.thing.net/~gh/artdirect/tactics.html This web art piece was a commentary on hyperlinks and their circular nature in reference to culture. The user linked onto one hyperlink, which followed another, which eventually led them back to an unexpected conceptual "link" on the homepage. For example, if the viewer clicked on "kill" on the home page, it would lead her to a page about America, the 10 Commandments, and how to be "Happy". If you clicked on these links, then it would lead you other pages from the home page about American culture, politics, and social "norms", eventually leading you back to the home page. One of the basic ideas was questioning where the boundary between technology and those who controlled it informed ideas and norms at the time. and featured in the exhibition catalog essay by Laura Stewart Heon on page 21. 1996 Eastern Connecticut State University "meme breeders"
1995 - New Museum of Contemporary Art "Courage"
In the early 1990s Hovagimyan started working in Media Art and New Media Art. Some of the pieces involve using a combination of photographs and text, often mimicking advertising. In May, 1994 his twenty billboard project for Creative Time, Hey Bozo... Use Mass Transit that received quite a bit of press. The work was seen on several newscasts such as Good Day New York and the NBC Nightly News (nationally). It was written up in the NY Post, NY Daily News, The New York Times, etc. A telephone interview with the artist and a report on the project was distributed over the AP newswire. Around the same time he began working with computers and the internet. One of the earliest internet artists, his first pieces, BKPC, Art Direct and Faux Conceptual Art were written about in the art magazines Art in America  and Art Press  He also hosted an internet radio/TV talk show called Art Dirt. The first of its kind, Art Dirt, is part of the Walker Art Center's Digital Studies Archives collection. 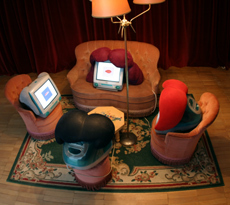 His collaborative works with Peter Sinclair include Soapopera for Laptops/iMacs, Shooter and Rant/ Rant Back/ Back Rant. Shooter, an immersive sound and laser installation was developed at Eyebeam Atelier as part of its Artist in Residence program. Four computers talk to one another, using synthetic voice and voice recognition software. During performances the computers are mounted on robot vehicles. They interact with each other and the human performers. When a guitar is played the computers sing along. In installation format the computers gossip with each other. ^ (1980) Collective Consciousness, Arts Performances in the Seventies, Publications NYC, New York. ^ Mass MoCA (1999). Billboard. Art on the Road. The MIT Press. p. 21. This page was last edited on 29 June 2018, at 07:16 (UTC).